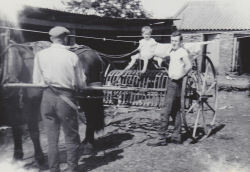 I come from a family steeped in tradition in working with draft horses. I was lucky in that i grew up when working horse were still the main power source. I believe that these early years of quietly working the land with my father and grandfather ignited my passion later in life to take up working with horses full time. With 20 years working full time in the woods and now the added bonus of my sons taking up the profession, it is refreshing to know that the next generation will carry on looking after our forests with these magnificent animals.
" leave only hoofprints and footprints"